I so gratefully received a copy of The Autism Playbook for Teens by Irene McHenry PhD and Carol Moog PhD months ago. I read it and immediately began implementing the strategies in it but it took me way too long to write this review. My deepest apologies to both the authors as this is a book worth having in your library, recommending to all your students and using for yourself. What I like most about this book is its straight forward, practical approach to empowering special ability teens. We can all learn something from this book! Self control is not an easy thing and each time I learn one of the strategies to teach to my students, I teach myself. In class, I introduce a mindfulness activity from the book to my students and then they practice with their families over the week. When we reconvene for our next lesson, we go over the past technique and when the right “teaching” moment presents itself, I introduce a new technique. Going about it this way, my hope is that as time goes on they will be able to draw forth these calming practices naturally to soothe themselves, build their self-confidence and help them interact more comfortably in social situations. I love this book because it enables teens with special needs to take control of themselves. I think the strategies presented are accessible to them and I highly recommend this book to teens, adults and professionals alike. It is user-friendly and is full meaningful and practical ways to make the mindfulness connection for teens with special needs. I see this book as a necessary addition to libraries, to schools, to yoga teachers, to parents and to anyone who is or who works with teenagers with special needs. 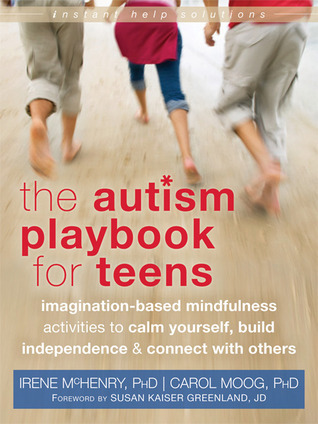 Full Disclosure: The authors provided me with a copy of The Autism Playbook for Teens to review. All opinions expressed are my own. Categories: Adamant Eve, Always Be Dancing, autism, Book Review, Education, Mindfulness, Nourishing Teachers Strengthening Classrooms, Special Needs, Teens, yoga | Tags: Accessible, ADHD, Autism, education, empowerment, inclusion, meditation, Mindfulness, teen yoga, teens, tweens, yoga, youth | Permalink. Thanks Eve! I’ll take a look.